Here’s a well-timed kit release, a movie tie-in that’s bang up to the minute. 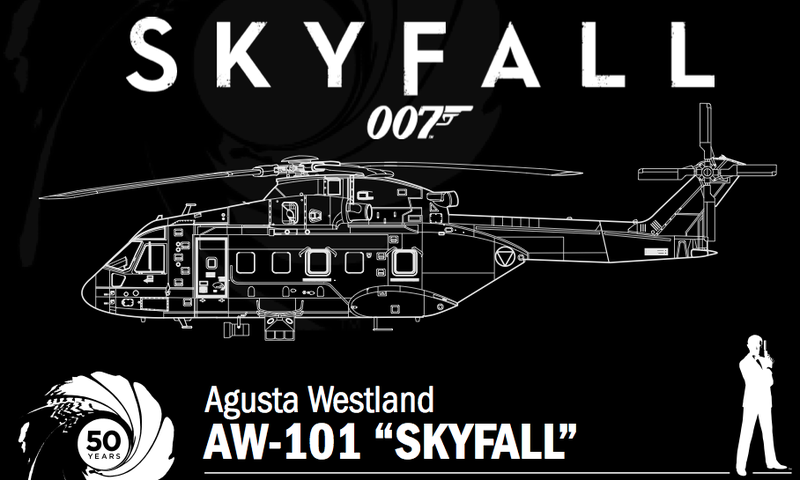 It’s a variation on Italeri’s existing AW-101 kit to 1:72 scale, modded slightly to represent the triple-engined beast shown in the latest James Bond movie Skyfall. We haven’t see the new James Bond movie yet (though an SMN Crew cinema outing is slotted for Wednesday this week) so we can’t comment on the accuracy or otherwise of this special Skyfall edition. But it seems a good idea and we’re all for kits like this, not least because they help attract newcomers to scale models. Matching the theme of the 1:72 plastic kit is a smaller diecast version, this time to 1:100 scale. It’s ready to fly out of the box and comes in Skyfall colours and markings. President John F. Kennedy’s World War II command, PT109, is a famous boat all right, and here is Italeri’s 1:35 scale model of it. As with other motor torpedo boats from Italeri, the PT109 is superb, and comes complete with multi-media bits and pieces - metal-etch components, wiring, decals - the lot. If you have room, build one. We've looked at PT boat kits before, so do have a look here. We visited the excellent RAF Museum, Hendon, UK, last week so we’re rather full of World War II information - which makes this 1:48 scale Sea Hurricane a well-timed model aircraft. The original was a stalwart machine rather than a graceful design, but a hugely successful warfighter nevertheless. Here Italeri has equipped the model with the standard drop-down tail hook for carrier landings, actually more of a belly hook, as it extended below the fuselage not far aft of the wing. The kit is an upgrade of existing Italeri moulds, but that’s good, especially as a metal-etch sheet is included, as are decals for no less than six different Sea Hurricanes. More Hurricanes at SMN here. No wonder Hitler lost World War II, dissipating time and effort producing so-called wonder weapons like the Mistel series. Here we have Italeri’s very neat 1:72 kit of a Messerschmitt Bf109, mounted atop a Junkers Ju-88, modified to represent the Mistel 1 version, in which the crew cabin is replaced by a hefty chunk of high explosive. 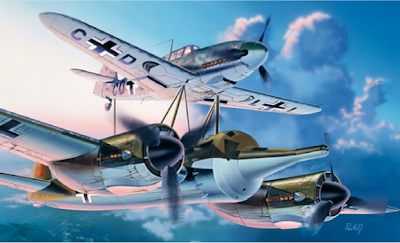 In real life, both these fine aircraft were wasted in this fruitless attempt to produce an accurate pilotless long-range bomber. Still, whatever the practical realities of actual combat, Italeri’s double-plane kit looks great when assembled. As a change, it might be quite intriguing to see a steampunk version of this, the finish modified with wood panels, copper trim, and maybe some leather sections. The prosperity of modern Germany was built on the production of fine machines like Mercedes-Benz trucks, and this 1:24 scale kit of the M-B 2238 reflects that heritage. The kit builds into an accurate replica, though maybe it lacks a little pizzazz - no wonder Italeri feels a need to flag out the supplied chromed bullbar. Perhaps the kit could do with something extra. Hmmm... what about some scale figures, a diorama setting, working lights, even a sound chip? 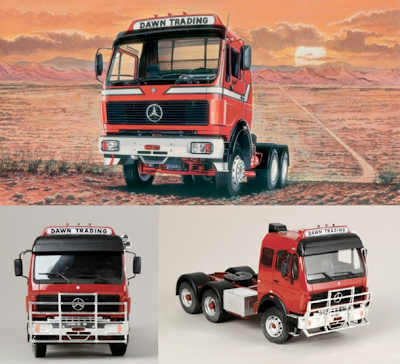 Oh well, maybe we’re being picky - for 1:24 scale truck fans it’ll make a decent enough addition to the fleet. 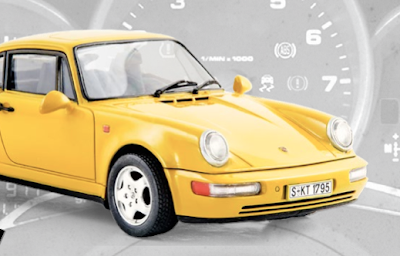 The Porsche 911 Turbo is another 1:24 scale kit, this time in Italeri’s ‘My First Model Kit’ range, a worthy attempt at introducing newbies to model making by including paints, cement, and various tools in the box. As for the car, it’s to scale with the Merc truck which is good (the two could pair in a diorama) and the subject matter is close to this writer’s heart as a one-time owner of the near-identical 911 SC. Mine also had the signature whale-tail spoiler, and was a nice car to drive, apart from an over-centre clutch action. The fascia was not so hot though, being manufactured with near-zero ergonomics, as if the designers had loaded a big shotgun with switches and dials - then firing the lot at the empty instrument panel, peppering the fascia with random bits and pieces. Terrific variety in this latest round of kit releases from Italeri. We’ll wait to see if we enjoy Skyfall on Wednesday - if so, then the EH101 immediately goes on the must-have list, though an evil satin-black finish is more tempting than standard-issue olive drab.